The striped skunk is a skunk of the genus Mephitis that is native to southern Canada, the United States and northern Mexico. There are five species of skunk in the United States. This includes the eastern and western striped, the hog nosed, the hooded and the spotted. Every state has at least one type; every state has some kind of a skunk problem. 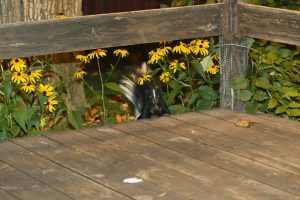 This article will detail some of the most common skunk problems we have in our country and then offer solutions on how to resolve these problems. A family of skunks explore their surroundings looking for food. The skunk we have in our country all can have at least one and some cases two litters a year. These litters can have at least two young or as many as ten. Skunk are nocturnal and will forage for food along established routes they know. Skunk don’t fear many animals; their scent glands can eject up to 10 feet and if provoked, they will spray! Skunk, like porcupine, seem to be a common problem for dogs. One would think a dog would learn to avoid both porcupine and skunk, but most don’t. Instead, they seem to find every one which comes onto their property. (Personally, I believe dogs like the smell of skunk. Read on to learn how to get rid of that nasty skunk smell when pets get sprayed). Striped Skunk in the backyard looking for grubs. Skunk eat just about everything including grubs, insects, plants, vegetables, fruit, frogs, small fish, garbage and just about anything you leave out in your yard which is organic. For this reason they can become a regular visitor leading to damage and smells most people don’t want or like. Once they find good food on your property, skunk like to take up residence and “move in”. It is common to have them move under trailers, mobile homes, sheds, porches, slabs or piles of wood. They’re also fond of moving into crawl spaces, sheds and pretty much any kind of structure man might build. Spotted skunk are good climbers; they will readily move into attics or openings of any home which will provide shelter. Because of the behaviors listed above, skunk can be a nuisance. When foraging for food in your yard, they will kill grass and plants. Garbage bags and cans will be turned over and strewn all around in search of food. Skunk will readily eat from gardens, fruit trees and storage bins. They will nest under homes creating smells that can be strong enough to force the residents to leave. Pet food which is kept outside will draw every skunk in the neighborhood and once they start coming around, it is only a matter of time before your pet is sprayed. Each one of these problems can be dealt with and resolved. 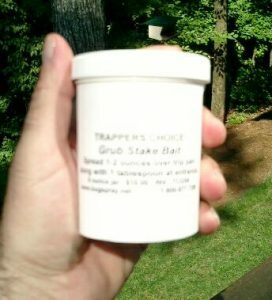 In some cases repellents will work; in extreme cases trapping may be your only option. 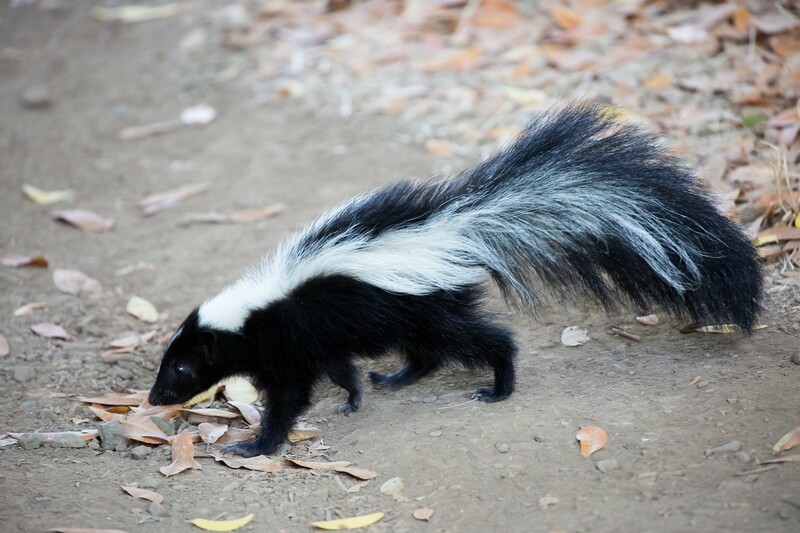 Once removed, the odor can be eliminated with our special skunk odor eliminator. Let’s take a look at these options. As stated above, Skunks are nocturnal foraging at night. If you find turf uprooted and thrown around the yard, it could be a skunk. Other animals that may do this include armadillo, raccoon and opossum. All of these animals (and others too) love grubs. In fact they love grubs so much, they’ll go to great extent to dig them up. So if you a skunk digging up your yard, one of the best ways to get it to move on is to treat the grub problem. Using the products we have listed in our GRUB CONTROL article, you will kill them in a few days. This in turn will cause the skunk to move on as they will only target yards with live active grubs. Taking away the grubs will help but once any animal knows they can find food in a yard, they tend to return. 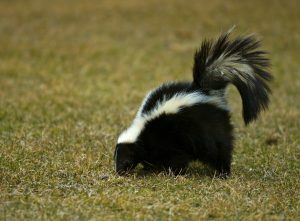 And though skunks might only be foraging at night, they still smell and can cause a property to stink. 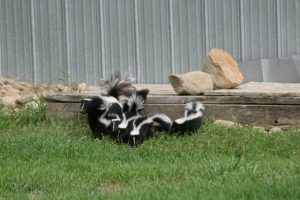 So if you have a skunk foraging around your property and want to keep him away, the use of a repellent can help. We have not found a granular or liquid spray that actually works well on skunk so we do not recommend any. But we do have two mechanical devices which work great. Trapping is also a good option. Live traps are an easy way to catch skunk and we even have a few kill traps. If you have observed skunks coming around the yard from time to time, there might not be anything in particular they want.But their smell can be strong enough to linger for days. This odor can be so offensive that you may want to stop them from coming around. There are two ways to achieve this. First, if you have identified where the skunk are traveling (where they’re coming from and where they head), install MOTION ACTIVATED WATER SPRAYERS along their trail. This device works by using water supplied by a garden hose. The unit has a motion detector and when it’s “eye” sees the target animal, it will activate the sprinkler head to fire water for 3 seconds. This will both frighten and spook the skunk causing him to leave. In most cases, one encounter is all it takes for the skunk to move on and never return. 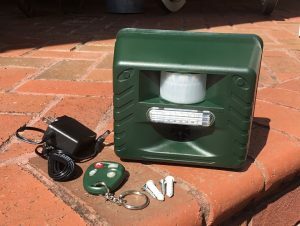 This device can protect up to 2,000 sq/ft and you can hook them up in series off one garden hose. You can also limit the “spray” range. In general, hitting the animal is not too important. The sound of the unit is generally enough to spook them for good. If you are not quite sure where the skunks are coming from or moving to, you’ll need a repeller that will cover a large area. Our SOUND REPELLER is ideally suited for the job. This device sends out ultra sound by default when activated. You can run the machine continously so the sound will be heard from 100 feet away or more. This alone will usually keep skunks away. It can also be powered by 4 “C” cell batteries. 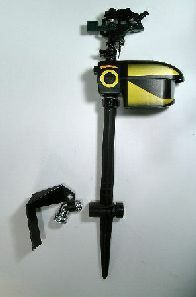 Using it this way will limit the activation to “motion detector” so it will only go off when skunks get within 35 feet. This unit can also be set to only go off at night or day so you have full control of when its most needed. Other features include a flashing light as well as an audible sound. It also comes with a remote control on/off wireless key. This way you can turn it off for a short while if you want to walk the pet or take a walk in the protected zone. When used via the motion detector, having the audible sound go off makes the unit more powerful so set it high as possible. It can go up to 100 DB but 20-40 is plenty loud to keep skunks away. Skunks aren’t afraid of many things. But they don’t like the sound this device releases so this is an effective deterrent. Each machine can cover up to 5,000 sq/ft so it has a big range. Units should be placed 2-3 feet above ground and pointed in the direction where animals are entering as well as “over” the turf you want to protect. If you have a persistent skunk, your best control may be to trap it out. This can be done with live cages, leghold or kill traps. Skunk can be caught in any of these devices as they’re not too wary since they don’t have many natural predators. And they’re bold so they do fall victim to most any set. This means you don’t have to be a professional to get results. Active skunks in the yard are easy to trap. You just have to decide if you want to live catch them or use a kill trap. Live traps may seem more humane but remember, you will have to deal with an angry skunk in a cage which can be “messy”. To help manage this process, we have a SOLID PLASTIC SKUNK TRAP. Made with super tough durable plastic, this trap will keep the animal secure and safe so its less likely to release scent. If you have them digging in the yard and suspect they are looking for grubs, use GRUB BAIT. for your trap set. Place 1 tablespoon all the way in the back, behind the trip pan, but be sure to smear some at the entry door. This will get any foraging skunks attention and once they get a lick of the bait, they’ll readily enter. Place traps in the yard where they’re digging or along entry paths they’re using to come to your yard. Once trapped, you may be able to destroy the animal yourself or you could choose to relocate it. Keep in mind skunk can carry rabies so don’t handle it. If it is relocated, be sure to take it at least 15 miles away as skunk don’t mind walking 5-10 miles to get back home. If you prefer to use a kill trap, the Bodygrip is the way to go. For skunk, a BG 220, BG 280 or BG 330 can all handle the job. 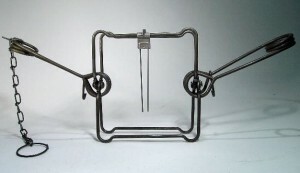 These traps work by crushing the target animal when they attempt to pass through the jaws of the trap. Death is generally fast, within a few seconds, and efficient. Skunk will generally be small enough to fit into the BG220 which measures 7″ by 7″ when set. But if you are placing the trap over a large hole, a larger size might be easier to employ. This way you don’t have to worry about sealing up gaps outside the trap jaws. Place a trap over a den hole, a hole in a fence or an entrance under a deck or crawl space. When matched right, the trap will encircle most of the hole and any skunk trying to pass will trigger the trap. Use as many traps as you have holes to cover. 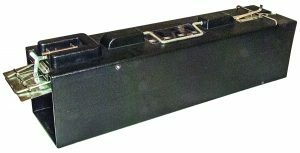 The BG220 is 7″ x 7″ and the most common used. The BG280 is 8.5″ x 8.5″ so slightly bigger. The springs are tougher to collapse too. Lastly, the BG330 measures 10″ x 10″ and should only be used if you absolutely need a trap this big. So strong are the springs of these traps that they will crush target animals to death in a matter of seconds. Be careful where they’re used and for most, its suggested that you use BODYGRIP SETTERS when making a set. Setters will give you much needed leverage to compress the springs. 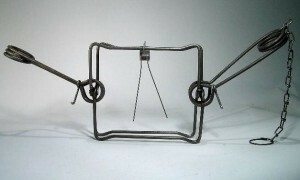 BODYGRIP TRAP STANDS can also be a big help. They will allow you to set the trap at ground level in front of den holes or other narrow gaps they use when walking. The trap mounts to the top and the rebar stake (the entire bottom of the mount) goes into the ground. They measure 18″ long so when driven into the ground, they’ll provide a stable way to secure the trap in place. And there is no need to worry about the smell of skunk getting on the traps; this actually works to your advantage. Traps which have skunk scent on them tend to be ignored and since the smell is so strong, it makes the trap stealthy. Once the skunk is removed, there could be a lingering odor you’ll want to remove. 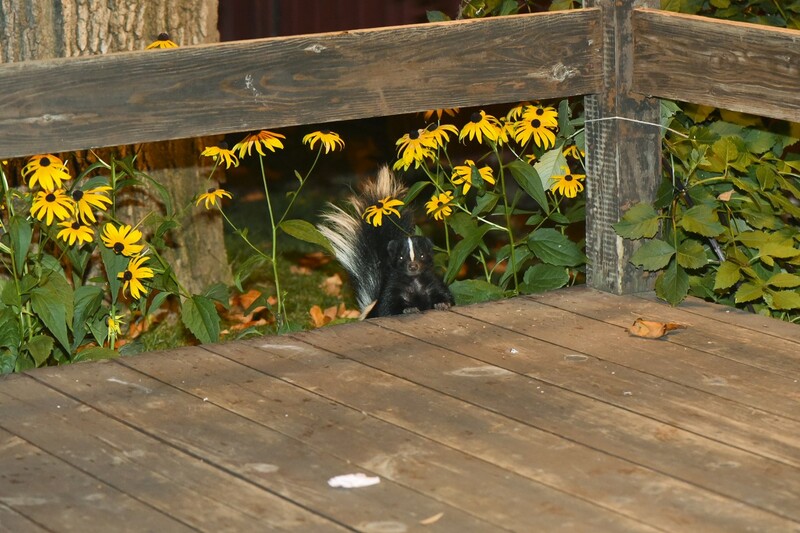 Skunk odor is super persistent and won’t go away on its own. But it can be neutralized. And you can get rid of it in the house or in the yard. The secret is N-7C. This odor eliminating concentrate is easy to use and is amazing. Basically it deconstructs odor molecules. Once taken apart, the odor is gone. It works immediately and in most cases, will neutralize the smell in an hour or two. N-7C can be sprayed anywhere so use it where needed. Attics, crawl spaces, under decks – even on grass and bushes. Add 8 oz per gallon of water and spray the mixture over 500-800 sq/ft. Use a good PUMP SPRAYER to distribute the mixture. 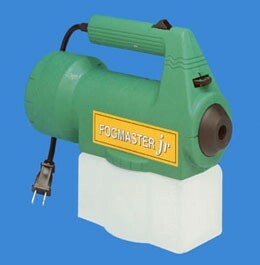 For large areas or if you can’t reach all parts of the space you need to treat, get a fogging machine. We have several that can do the job well. 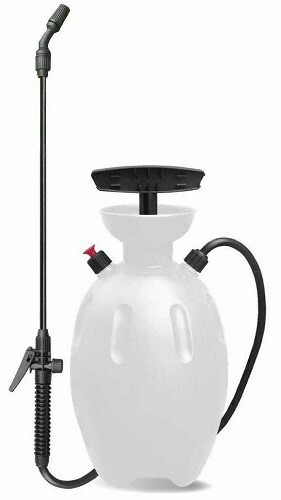 The MINI FOGGER will blow the fog 10-20 feet. It holds 32 oz of mixed product and is good for treating small spaces where you don’t want to go. If you need more power, go with the FM6208. This machine features a 1 gallon tank and will blow the mixture 25-30+ feet out. It will apply a full gallon in about 12 minutes so you can treat attics, crawl spaces and even the yard in no time. If your dog or cat gets skunked or if you need to deskunk your clothing, go with D-DKUNK SHAMPOO. This product is not a coverup or masking agent. 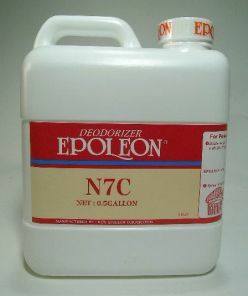 Like the N-7C, it will targets the skunk scent odor molecules and unlocks them from clothing, hair and skin. Once loose, the acidic based spray will be rinsed away and the odor gone. Use 8 oz for dogs 40-50 lbs so the pint will be enough to give them two thorough shampoos. Results will be immediate though two applications can sometime be needed. Skunk are very much a problem throughout the United States. Their feeding habits can wreak havoc in yards, gardens or garbage. Treat turf with Delta Guard Granules and Cyfluthrin to reduce insect food supplies which will force the skunk to look elsewhere for food. Apply Repellent where they are active to keep them from nesting under porches and other areas where there are spaces available. Use Ropel Liquid on plants or garbage to stop them from chewing and eating. Add the Skunk Guard to get maximum protection from being sprayed. Once local skunk are removed, use NC7 to eliminate odors left behind and Pet Shampoo to eliminate the odor on pets which have been sprayed. Is the skunk home just burrows or is it a nest that needs to be removed once the skunks have moved out? Does the nest need to be removed if we want no traces of skunk odours? Any advice appreciated. Great question. In fact skunk dens are essentially just burrows and there is nothing physical to remove. However, their odor will no doubt linger and this can be offensive. Additionally, female scent (which is most likely what you’d find in any skunk den) is full of pheromones that will attract curious males. To prevent skunks from coming around, you’ll need to neutralize the odor. So once the skunks have been removed and relocated using one of the methods above, you’ll need to drench the den with the N-7C listed above. The best way to do this is to mix up some in a bucket and pour it down their burrows. Use 2-3 gallons per hole and give it a couple of days to see if that does the job. DO NOT COVER UP THE HOLE till the scent is gone. This can require 2-3 treatments depending on how deep the burrows go, how long the skunks were living in the space, how dry the soil is, etc. My dog was sprayed directly in the face. Is this product safe to use on her nose, around her eyes, ears and top of her head? Do skunks like tomato plants? If you are asking about our skunk shampoo; the answer is yes. It can be used anywhere on the pet. The odor neutralizing component will not pose any hazard to your pet. As for the skunk and tomatoes? They love them. Also, I believe the skunk was living underneath my kennels. We have flipped them over, blocked all holes in the fence, will the skunk find another way in my yard? Odd are it will stay in the area but it will hinge mostly on whether or not the skunk is getting food from your yard. Skunks love to be around vegetable gardens so if you have a good producing garden, it would like to live close by. But they also love dog food. So if you’re feeding your dogs outside and the skunk has had free access to left over or spilled food, it will surely want to continue living close to this vital food source. So in the end, the best way to deal with this type of problem is to live trap the animal and relocate it elsewhere. If a skunk is caught in a body grip trap or is killed by other means and is dead, will it still discharge it’s liquid odor because its muscles are relaxed??? I seem to be infested with them and need guidance or nose plugs. Thanks Ed. We have seen odor issues whether they’ve been live trapped or caught in a kill trap. Fortunately it’s easy to remove this smell using with the N7-C listed above in our article. It works great on skunk odor and can neutralize it with one treatment so this shouldn’t be a problem you can’t handle. But first, get rid of them as this will make the cleanup a lot easier to manage. We have a skunk under the house who sprays every 4 hours or so. We have put out traps to no avail. The smell is overwhelming and I am afraid we will have to leave the house. Have had exterminators out to take care of it but they say there is nothing they can do. What suggestions do you have????? If you review our article above, you’ll see that trapping is the only method of skunk removal which is productive. Now whether you use a live trap or a kill trap, the choice is yours but both methods will yield positive results when done properly. And if you wish to tackle this problem using a trap, you must first get the skunk to “feed” somewhere a trap can be deployed. In most cases, this will be best just outside his entry way to under the home. So with a little detective work, you should be able to locate where he’s entering and leaving. Alongside this area you should place out some of the Grub Bait we have listed above. Just a teaspoonful on a paper plate would be fine to see if he’ll be attracted to the bait and feed. Remember, you’re doing this with no trap at first. This way you will be effectively teaching him to look for food at a location you choose which in turn will be where you’ll set up your trap. In our experience, no skunk can resist this bait and I’m sure it will be readily accepted by your skunk. But for the first couple of nights, don’t put the Grub bait deep in the trap nor should the trap even be set. At this time you’re still in the “conditioning” or pre-baiting phase. So for first night with the trap, you’ll need to place a teaspoonful of grub bait on a paper plate about half in and half out of the trap. Use a twist tie or cable tie and lock the trap door open during this phase. This way the trap will remain accessible and never have a chance to close shut and spook the skunk. Once you find the bait gone, set some more out the second evening but this time place the plate half way inside the trap so it’s just in front (not behind) the trip pan. This will be about midway in the trap. And after you find the bait is taken from this “half way” spot in the trap, you’ll be ready to make the real set with the door not wired and ready to go. At this time the bait will be placed behind the trip pan so that when the skunk goes to feed on the Grub bait, he’ll surely step on the trip pan and get caught. I would appreciate your help. My husband and I live in a large home in the suburbs near Chicago. Looking out our kitchen window we see our driveway and past that our neighbor’s front porch and entrance, which they never use. Just outside of their porch is a hole which is the home of two young skunks and either the mother, or father, maybe both. What is the best way to get rid of them? In reality, this is not actually on our property, but since these neighbors never use this entrance or this side of their house it seems to be “our” problem. I would at least like to pass on some suggestions to our neighbors as to how to rid our homes of these rather large creatures before them establish a community. The gentleman of the house poured some cement down the hole to close it and another hole was dug almost immediately about a foot from the original one. Also the lady of the house put down some deterrent in the hole and this, too, did not seem to bother them. Do you think that a large rag soaked in ammonia and put down the hole would help, or not? I would appreciate any suggestions that you could offer. 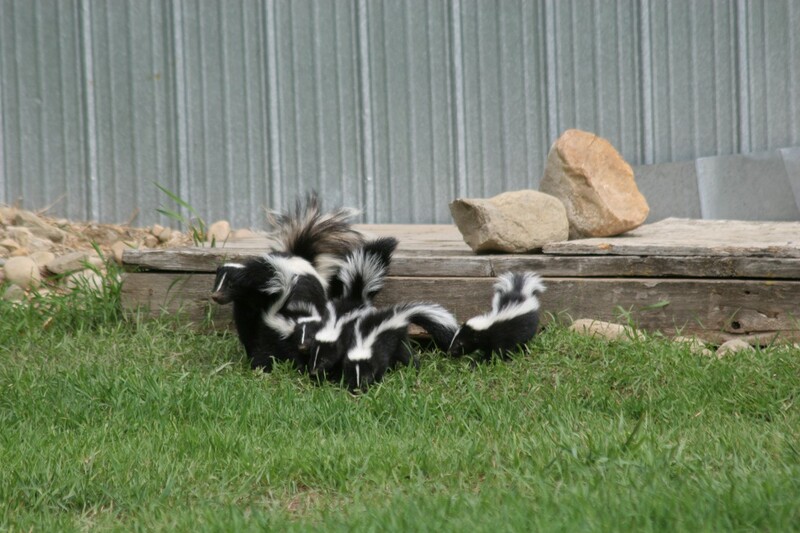 First, this family of skunks is already established and part of your local “community”. This occurred as soon as their den was dug earlier this year (or late last year). Second, if you read our article above, you’ll learn that repellents will not deter them once they’ve got a nest. So any attempt to seal their entrance holes or apply some kind of smelly repellent will have no impact. That means you’ll either have live trap or kill trap the family (also explained above). Now even though they’re not nesting on your property, it will be pretty easy for you to catch them. All you need to do is get some of the Salmon Paste we have listed above. Once you receive it, set some out on a tablespoon on a paper plate close to their den (but still on your property). They will probably find the offering within 1 day because they have a great sense of smell and love our Salmon Paste. Now once you see they are accepting your offering, live trapping them using the Salmon paste and LT111230RD Cage will be easy. And once you catch them, either relocate them at least 25 miles away or call your local animal control office. In most cases, if you call them to report you’ve live trapped a skunk, they’ll come by and take it away free of charge.